I read most of Tokein's book, and I was always pretty perplexed by the song lyrics Tolkein would always write. Usually, I thought they were a bit excessive and I'd skim past them. However, sometimes I would try to imagine what this music would actually sound like. I can't remember exactly what my mind concocted, but it could very well have sounded like Tyrannosaurus Rex. This group is a duo, and its principle member Marc Bolan requires no introduction. But the second member is such a Tolkein nut that he changed his name to "Steve Peregrin Took" to honor the hobbit even though his real name is "Stephen Ross Porter." If he were a teenager in the '80s, he would not only attend Dungeons and Dragons competitions, but come in elaborate costumes and talk in accents he made up himself even when he's chatting with his friends before the event. (OK, I don't know the guy and I'm only guessing about this ... He died before I was born, so there's no way we could have even met.) But anyway, this guy is present with Marc in these weird, early albums, and I can only suppose that he was a considerable influence. This doesn't sound anything like glam-era T. Rex. It's hard to even imagine that Marc Bolan (a considerable teenage heartthrob for English girls in the early '70s) would even be associated with something this goofy, obscure and geeky. The song structures are weird, and it's like they were completely trying to reinvent the art. Every song definitely has a melody that's more or less memorable by itself, but it's operating on a different spectrum --- much like Kate Bush's debut album 10 years later. It's difficult, if not impossible, to pinpoint exactly how this stuff came into existence. I don't even think drugs would explain it --- and these guys probably weren't insane, either. Nah, they're just weird and creative. If you're going to pigeonhole this music in a genre, you'd have to call it British-folk, but that's only because of the instruments they use and they're British. It sounds like all they could afford was an acoustic guitar, bongo drums, a gong and a xylophone, which was on-rent. Nobody really seemed to know how to play the xylophone --- it usually just plays along with the vocal melody. Yet, a few of these songs seem to mimic R&B music --- notably speaking of "Hot Rod Mama." Give it a normal singer, a regular guitar and drum combo, and you'd have something that would fit perfectly into the early '60s --- it might even be a perfectly enjoyable song. But instead of doing something normal, they put it to acoustic guitars and bongo drums. And, Bolan's voice is so out-in-left-field that ------ well, it's just weird. Speaking of the vocals, they even sounded unique during his glam era. 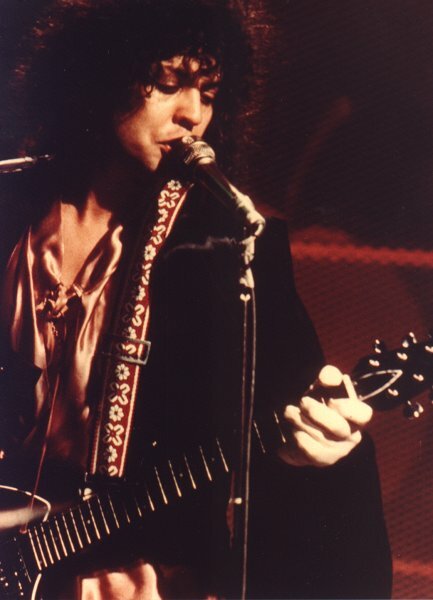 Bolan was easily one of the most easily recognizable singers ever, and his vocal performances are always entertaining. He had that going right from the start --- that characteristic wheezy warble is as charming as ever. Moreover, he manages to twist his voice to do even stranger things --- like imitating make-believe animals from the Hobbit world or something. He seems to have a knack for coming up with weird vocal ideas in these songs, and that just makes these weird tunes even more enjoyable. 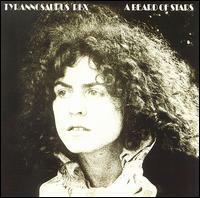 And the next chapter in the glorious book of Tyrannosaurus Rex's career is --- um --- kind of like their debut album My People Were Fair... except not as fresh, exciting and new. In fact, you might call this an inferior clone! Not that I hate to agree with George Starostin, but his review hit the nail so squarely on the head that I can't help but blatantly plagiarize his opinions! Unlike the previous album, which was completely bonkers and a lot of fun, this one is significantly more monotonous and boring. That's such a shame, because they were enjoying that Tolkein-esque nonsense from the previous album so much. Bolan seems to be concentrating on streamlining his music instead of favoring the ultra-weird stuff that he was trying out in his debut album. What I mean by that is this music doesn't sound quite as fresh and unique as his debut --- but he's still doing the exact same thing. Maybe he was trying to make the music more accessible --- who knows. He was probably just getting lazy... So, I guess this album is only recommended to people who loved the previous album to death and they can't live without this weaker but similar follow-up. But this album isn't a complete waste. I like a few of these songs mightily. "Aznageel the Mage" is my favorite track from the album not just because the melody is catchy and enjoyable, but good old Geekular Took chimes in with some really weird back-up vocals. That gives the song an extra dimension that's absolutely wonderful! I wish they had that mentality all the way through this thing. Unfortunately, you're going to have to sit through songs like the hopelessly bland and meaningless "Trelawny Lawn" (though I like the song title) and the toneless "The Friends." For one last final assault, they lay down a smelly egg with the final track, "Scenescof Dynasty," which just consists of Marc Bolan chanting two bars of music with a repetitive clapping noise. ... Yeah, who needs any of that?? I have to say I still like this album, because it is weird, above everything else, and it's still kind of fun to listen to. Furthermore, I always like hearing Bolan's spritey voice! It's just a shame that he couldn't lift much of this material off the ground. 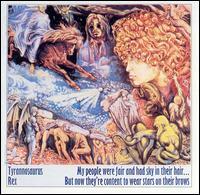 This is the first Tyrannosaurus Rex/T.Rex album I bought thanks to a glowing review I read of it you-know-where. I knew that it was supposed to be weird, but I had no idea how weird until I took a listen for myself! ... Yeah, and I didn't even like it when I first put it on. Like a persistent buggar, I had the album on loop in my car and probably played it eight or nine times while I was driving around to classes and work. I'm not sure that actually helped me like it, but it certainly got me used to it. However, I sure remember having those funny tunes running through my head that week! At least it's memorable in that respect! This is a lot like their debut album, My People Were Fair... except the music is more complex --- they incorporate more involving melodies and certain instruments such as a harmonium, xylophone, and a wide variety of percussion instruments. But this group's best instrumental asset as always been Bolan's warbly faun-like vocals, which he puts to great use as always! He manages twists his voice in strange ways and overdubs it as some background instrumentals, which produces a much more unusual and interesting effect than a synthesizer could have! The voice could be difficult for some ears, but I doubt most listeners who would dare purchasing this would have much problem. Marc Bolan got rid of his weird friend Steve Peregrin Took and hired Micky Finn. It seems universally reported that Finn wasn't quite as musically gifted, but he was much easier to work with. Furthermore, Bolan had a sort of vague notion about commercializing his sound to start appealing to a wider audience and I'd have to guess that Took was venemously against that idea. Bolan begins his commercialization with Beard of Stars, but it is still a far cry away from his commerical smash Electric Warrior released a year later. The mood of the album continues to sound obscure and folky, but never before has the electric guitar been featured on any Tyrannosaurus Rex album. Bolan takes the opportunity to shred his guitar on a few spots notably at the end of "Pavillions of Sun." The most glam-like song of the album is probably "Elemental Child" that features a sort of electric guitar riff. But really that's quite a way from actually sounding like glam! It's a little too weird for that. "First Heart Mighty Dawn Dart" even sees the inclusion of an electric bass, which is also new for them! 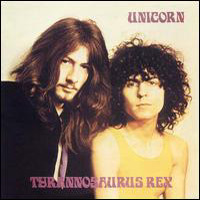 The bad news is that with this new sound, T.Rex loses some of its old charm and much of the unique flavor that made Unicorn so heartening. The interesting textures and atmospheres that were developed so well are also nearly absent here. This is where Took's talents were particularly missed. However, the good news is that Bolan hadn't quite given up on being unusual and, most importantly, writing good music! There isn't a weak spot anywhere on here. "Organ of Blues" is probably the weakest bit on the album, but that one still had an interesting atmosphere. Beard of Stars might not be so much of an inspired work, but at least it's a good listen! 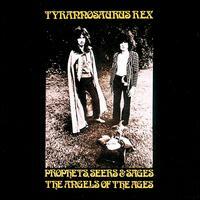 Needless to say, anyone who loved the earlier T.Rex albums must find time to check this out too.